Cooking for two can be a challenging. But as the old saying goes, where there is a will, there is a way. For me, the biggest issue is leftovers. When our grandson, Rakeem, was in town and coming over for supper two to four times a week, it wasn’t that big a deal. But now that he’s gone away for college, I’ve had to come up with some new recipes or cut back on some old ones so we aren’t eating the same thing for a week. We had a bit of a reprieve recently when he came home for a visit. 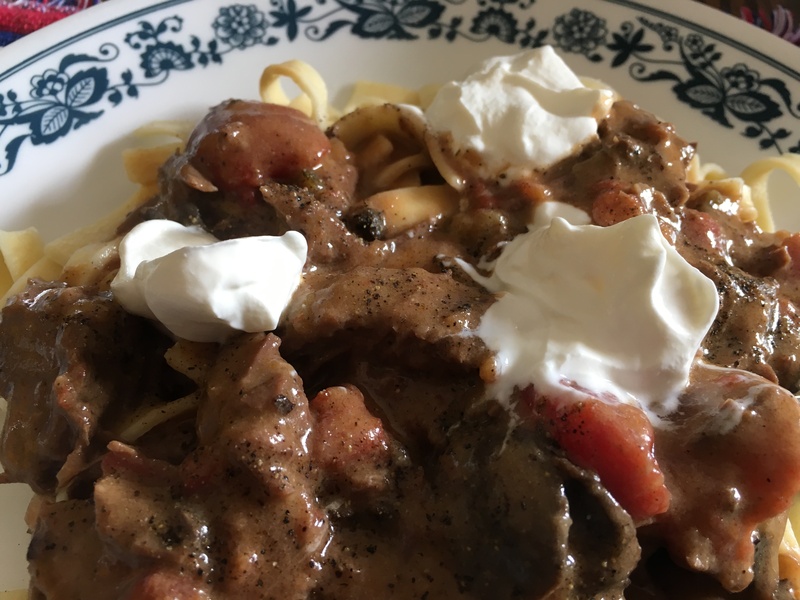 I made a couple of his favorite meals — Swiss steak and spaghetti with meat sauce — while he was here. His appetite assuredly cut back on the amount of leftovers. However when preparing the Swiss steak, I had a pretty good chunk of meat remaining after cutting slices off a 3- to 4-pound bison roast and no plan for the remainder. That’s when I started searching through cookbooks and on the internet for recipes that might give me some ideas on what to do with the large hunk of roast. After looking over more than a dozen recipes, I put together the following concoction, which vastly exceeded my expectations. And needless to say, the leftovers didn’t last very long. Put the onion soup mix on the bottom of the slow cooker. Brown all sides of the roast in a skillet. Remove meat and place in slow cooker. Add soup, flour and Worcestershire sauce to the hot skillet, cook until smooth (add water if you are using condensed soup). Pour over the roast in the crockpot. Add tomatoes and mushrooms. Cook for 6 to 8 hours. Remove the roast and cut into bite-size pieces. Stir the sauce. Mix in a few dollops of sour cream. Add the meat and mix. Serve over egg noodles tossed with butter or mashed potatoes. Sprinkle some dried dill on top of stroganoff and noodles or potatoes along with a few more spoonfuls of sour cream.